Dirty Birds: Does Pastured Poultry Mean More Pathogens? While it’s still a small market, pastured poultry — a method of raising poultry on open pastureland — has flourished in recent years as consumer demand for humanely-raised, antibiotic-free meat has risen. Unlike “free range” birds, which are sometimes raised indoors, pastured birds roam (within movable fencing), sleeping inside coops at night. Poultry raised on pasture is happier, farmers and their customers will tell you, and safer to eat than birds pumped full of antibiotics. But two recent reports show that pastured birds are teeming with just as much harmful bacteria like salmonella and campylobacter – bacteria responsible for symptoms like cramping, fever and diarrhea that can sometimes result in death – as their conventional, confined brethren. The studies comprise some of the first food safety data collected on pastured poultry. 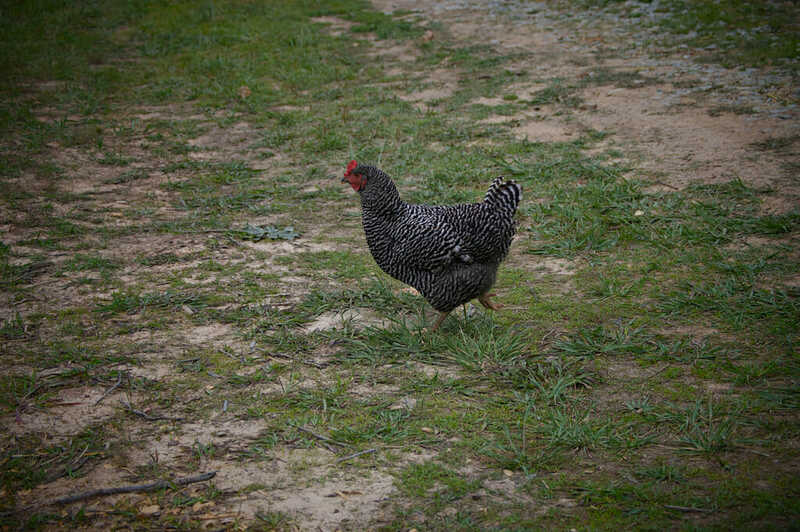 A forthcoming study of pastured poultry funded through the USDA’s Sustainable Agriculture Research and Education program, to be published in the journal Food Control this November, found high levels of salmonella and campylobacter among pastured poultry flocks sampled from Louisiana, Arkansas and Georgia. Depending on how the pastured bird was processed – a nice word for slaughtered – salmonella was present in alarming amounts. Funded by a $250,000 USDA Sustainable Agriculture Research and Education (SARE) grant, researchers, led by Walid Alali, an assistant professor in the University of Georgia’s Center for Food Safety, looked at pastured chickens processed on-farm, in a mobile processing unit (a kind of portable slaughter house) and at a USDA-inspected processing facility. Few studies have looked at pastured poultry from any angle beyond its economic impact for small farmers. Among pastured chickens processed at the USDA-inspected facility, 43 percent tested positive for salmonella and 82 percent tested positive for campylobacter. None of the chickens processed on the mobile unit tested positive for salmonella, perhaps an anomaly, Alali noted, though 100 percent of the carcasses sampled were positive for campylobacter. And of pastured chickens processed on-farm, 89 percent of the sample tested positive for salmonella and 70 percent for campylobacter. These numbers don’t gel with the standard. Among pasture chickens processed at the USDA-inspected facility, 43 percent tested positive for salmonella and 82 percent tested positive for campylobacter. Among pastured chickens processed on-farm, 89 percent of the sample tested positive for salmonella and 70 percent for campylobacter. The USDA department charged with inspecting poultry essentially expects salmonella and campylobacter to be present at processing facilities. Chickens are great incubators for both – once the bacteria gets in their gut, it flourishes and then they pass it on to one another. The Food Safety and Inspection Service (FSIS) tests “sets” of chickens taken from a facility after the carcass has been chilled. Out of 51 chickens tested in a set, only five can test positive for salmonella, and about 10 can be positive for campylobacter. Processing facilities do regularly exceed these benchmarks. Recently, Mississippi facilities were cited for extensive unsanitary practices. Overall, though, quarterly inspection reports show that facilities regularly meet or beat the baseline standard. The USDA department charged with inspecting poultry essentially expects salmonella and campylobacter to be present at processing facilities. Another study from Penn State, published in the Journal of Food Safety, corroborates the data compiled by Alali. Surveying whole chickens bought at farmers markets, researchers Catherine Cutter and Joshua Scheinberg found elevated levels of salmonella and campylobacter. Cutter says she and Sheinberg delved into their research after noting an uptick in meat purveyors at local farmers markets, a trend that deserved a food safety assessment, especially since many consumers perceive pastured meat as safer. Compared to chickens bought at grocery stores and tested for pathogens, the whole chickens purchased directly from small farmers exhibited higher rates of salmonella and campylobacter. So where is all the bacteria coming from? When inspected processing isn’t available, pastured poultry is slaughtered on-farm. Many small farmers don’t have access to the same kinds of large-scale offsite processing facilities that bigger poultry businesses use. Independent processing facilities are either non-existent, are too expensive or aren’t preferred by some farmers for ideological reasons. So, many pastured poultry producers slaughter birds at the farm. On-farm processors often don’t apply the same antimicrobials, like paracetic acid, that industrial processors use to kill bacteria. FSIS’s quarterly inspection reports show that the smaller the facility, the greater the pathogen prevalence. In an interview, Cutter expressed a need to educate small processors, and poultry farmers, on basic food safety practices in the slaughtering process. Increased contact with wildlife may also be a problem, according to Alali, who presented his findings to a sustainable agriculture workshop at the University of Georgia in April. (He declined to be interviewed for this story, saying he had a packed research schedule.) At the conference, Alali said his research showed that pastured chickens come into contact with wild birds and small pests like rats, with pathogen-laced feces. A new rule proposed by the FDA requiring permanent canopies and fencing for large egg-laying flocks echoes the worries over wild birds and rodents expressed by food safety scientists. But species interaction in the fields, as part of a rotational grazing system, is at the core of pastured poultry farming practices, Badger said. “This idea that species can’t co-mingle isn’t something we subscribe to,” he said. Cutter said she didn’t think antimicrobials are used in on-farm processing or in small facilities. APPPA’s Badger, a Pennsylvania farmer, said Cutter was right, but questioned why he would want to bathe his birds in chlorinated water as is done in conventional processing. Customers don’t buy pastured birds for antimicrobials. Alali also blamed poor composting practices among some pastured poultry farmers. Once the birds are killed, some farms will compost their unused bits with the hope of eventually using the waste as fertilizer. But to kill the pathogens, chicken waste must reach a certain temperature for a specific amount of time, a task not always completed by busy farmers. Salmonella and campylobacter were also present in soil and water samples taken at the farms that processed their flocks on the premises. Alali’s research noted wastewater from the slaughtering process helped spread pathogens around the farm. White Oak Pastures is the Southeast’s largest pastured poultry and grass-fed beef producer. Owner Will Harris says they don’t market their chicken as safer than conventional, although he wouldn’t be surprised if consumers believed such a thing. Harris owns and operates a USDA-inspected processing center on his south Georgia ranch, and he knows the inspector checks out all 1000 birds killed, defeathered and chilled each day. Conventional poultry operations process a quarter million birds in a day, Harris says. To him, that lack of processing volume at White Oak means his product is at least better inspected than a bigger company. Despite the data produced by Alali’s research, the Centers for Disease Control and Prevention in Atlanta has yet to attribute an outbreak of salmonella or campylobacter to pastured poultry, according to spokesperson MarÁ­a-Belén Moran, though the center recently connected a multi-state salmonella outbreak to live poultry sold from an Ohio hatchery. And in 2012, more cases of salmonella were attributed to backyard flocks than in any year on record, though those infections were linked to poor sanitary practices after interacting with live birds, and not tied to slaughter. Salmonella infection is a common discussion subject on online forums like Backyard Chickens, where backyard flock keepers discuss salmonella-like illnesses, especially in children, they believed to have spread from their chickens. “Just because you haven’t heard of [illnesses], doesn’t mean there haven’t been any,” says Doug Powell, a food safety expert and publisher of food safety blog, Barfblog. “Most foodborne illnesses go unreported.” Pastured poultry consumers are such a small market, Powell says, that an outbreak the size that pathogens on conventional poultry can produce is unlikely. Though worlds apart in philosophy, pastured poultry and conventional poultry operations clearly have something in common – something microscopic. Poultry is to blame for 17 percent of salmonella breakouts in the U.S. Some large poultry processors are trying to stop salmonella and campylobacter before it starts – administering an experimental vaccination against it to live birds. But the shots have not yet proved to be 100 percent effective. Basic cleanliness is still the best defense against pathogens. Cutter emphasized that they aren’t out to put farmers out of business. If chicken is cooked properly and handled safely in the kitchen, then consumers are safe. After testing the birds for salmonella and campylobacter, Cutter and Sheinberg ate the pathogen-infested bird. After cooking the hell out of it, of course. This research simply helps consumers make educated choices, she said.